I’d hoped to send this out starting with the autumn equinox, leading up to the winter solstice. But life intervened, and only now am I back to the task. For those wishing to make preparations over a short period, I recommend tackling the following project over a three-month period of 13 weeks. For those with less time to devote to medical prepping, the goals for each week could become monthly assignments instead. Week 01 focuses on organization and assessment. Who will you be caring for? What are their current and future health needs? Is anyone asthmatic, or diabetic, perhaps? Individuals with chronic medical conditions will require special preparations. How about birth control or baby formula? Can you help a new mother learn to nurse? If things go south, will you rescue your grandmother from a nursing home? And are you prepared to care for her? Will you need a wheelchair, a bedside commode, special food or medications? Think through what it will likely take to keep your group both healthy and happy. Next, what particular disasters are you planning to prepare for? Should a flood or hurricane hit, what are you hoping to accomplish? How far along are you and what would it take to achieve a state of readiness? I advise a written plan. Start now with notebooks and charts. Decide who will be in charge, and make sure to include back-up personnel. One person cannot do it all, and as with all preparations, redundancy is ideal. Cost is a factor for everyone, and you should not spend your entire prepping budget on medical needs. Food and shelter come first, and some would add defense to the list. Prioritize and decide what is most important to you. Certain items are harder to come by than others, which should be assessed early on. A few are included in the chart below. Make plans to acquire these items gradually, or when the occasion arises. Keep an eye on the ads and buy in quantity when sales are offered. Shelf-life is an additional consideration. How soon products with a short shelf-life should be acquired depends on your expectations for the future. If you believe 12/21/12 is the end of life as we know it (except for those who are prepared), buy these products now. If you believe America has more time, then purchasing them at a later date may be desirable. Make sure to store all medications according to printed directions, and to have a refrigerator available for products that require cool storage. If a powered refrigerator will not be available, learn how to make a pot-in-pot evaporative cooler. Do not plan to freeze items that should be stored at room temperature. Freezing may damage fragile capsules and sometimes chemical structure as well. This article along with this week’s outline including a checklist for topics mentioned above can be downloaded at the link below. Please feel free to print this out for your own notebook, and to modify as needed. To download a PDF version of this post including CHECKLIST for WEEK 01, CLICK HERE. The supplies listed under OTC are all available without a prescription, though some are only available online. For prescription items, assess what your group has and what each member is likely to be able to acquire. Rx MEDICATION-DEPENDENT PERSONS Medication-dependent persons should assess their long-term needs and make a list of needed long-term prescription refills to request from their physician. This is best done in person, per Week 2, below. This entry was posted in Power supply, Preparation, Slide show, Stockpiling medical supplies, Vaccination. Bookmark the permalink. 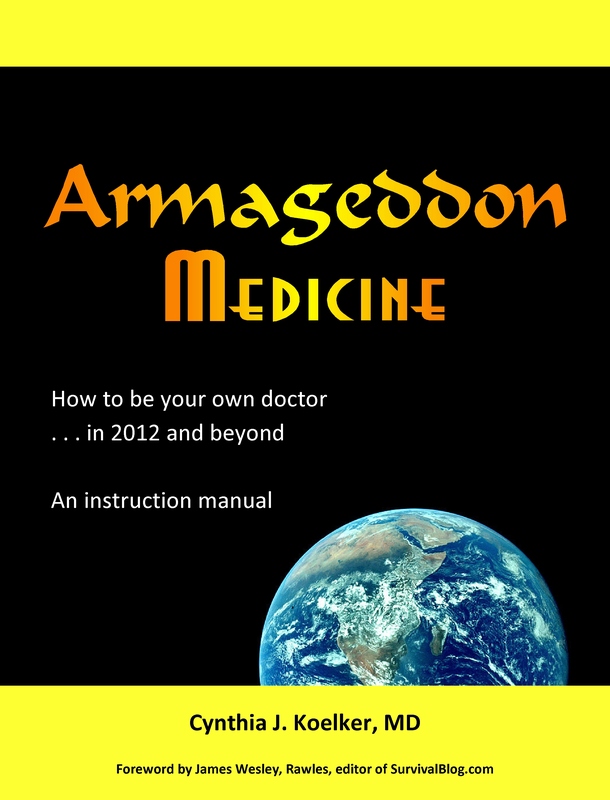 I do own your Armageddon Medicine book, so if the plan is in it, just let me know.